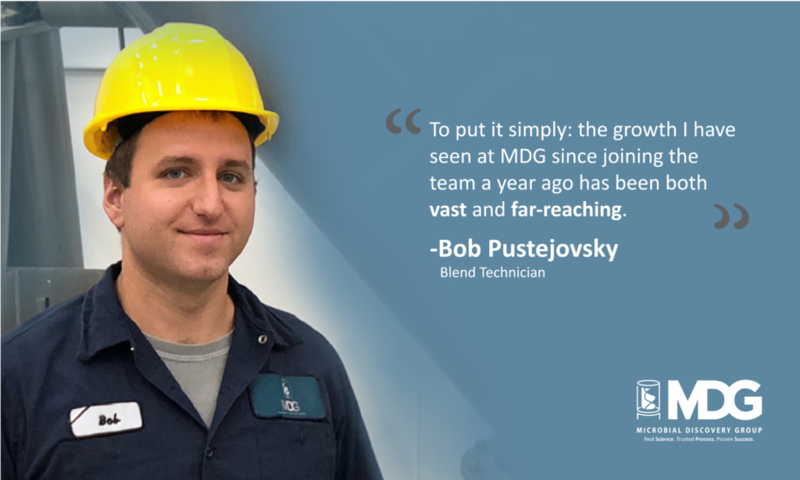 Under the Microscope is a member of our Blending Operations Team, Bob Pustejovsky. Bob is one of the team members working in our new facility in Oak Creek, WI and is one of the last employees to handle the very products that leave our shipping docks before arriving at our customer’s location. I wasn’t very happy with my previous line of work and was looking to try something completely different. Everything that I had heard about MDG sounded awesome, and I really liked the idea of having a more physically active job instead of just sitting around all day. Most days I’m putting together formulas for either liquid or powder blends. I’m weighing out ingredients and loading them into the mixers to spin. After everything is nicely blended, I collect samples of the formula and we send them to our friends in the lab. They test the samples to ensure we have a quality product and if everything looks good I package and ship it off to our customers. Now, I’m getting ready to grind up a batch of pure culture that was just shipped over to us by the fermentation team at the Franklin facility. I’m also helping to make prototypes for an upcoming project. I’m learning new things every single day. Every day here is different and presents new challenges. Looking back, when I started here a year ago, I really didn’t know anything about anything. But I’m passionate about learning new things and now I’m operating obscure machines most people have never heard of. I love the feeling that I’m contributing to a worthwhile cause. MDG is working to feed, clean, and save the world and I’m excited to be devoting my time and effort toward that end. In my opinion, we’re doing something here that’s meaningful. I like reading, listening to records, and occasionally bothering my cat. I also like exercising and doing really anything outdoors. I want to keep learning new aspects about fermentation and the business in general. I’d love to take some science classes, so I can better understand that end of it as well. To put it simply: the growth has been vast and far-reaching. When I started at MDG, the Oak Creek facility was basically empty. Now it’s full of product inventory and new machines. We’re using the gigantic Munson mixer and firing up the packager to make our own water-soluble packets. This is all, of course, in addition to the enormous Discovery fermenter which was installed in Franklin this past winter and has increased production considerably.